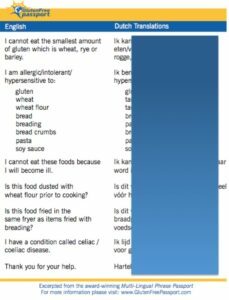 Travelling to a foreign country as a coeliac can be a bit daunting, but gluten free translation cards make explaining your requirements a little bit easier. 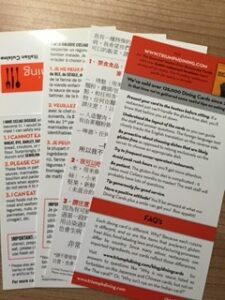 A gluten free translation card is a brief explanation of what the gluten free diet entails in the language of the country you are visiting. You know how easily the message can get ‘lost in translation’ in your mother tongue, so these cards are an essential part of travelling as the waiter can take it to the chef to discuss which meals may be suitable. 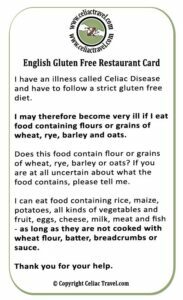 There are a number of places you can find this sort of information – your country coeliac association, bloggers and businesses that specialise in printing cards for all sorts of dietary requirements. 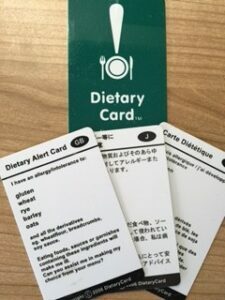 Some companies will allow you to create a customised card, so for example you could explain that you are both gluten and dairy free. The following lists some of the sources I have used for my translation cards (both free & paid for) – it is not exhaustive, so you can easily search online for more information. Free individual country downloadable translations that you print yourself. A free app ‘Gluten Free Restaurant cards’ is also available on iTunes. 54 languages available – too many to list! You have the opportunity to donate via PayPal if you are able to support them maintain this service. Individual country downloadable translations for USD$ 2.99 each that you print yourself (you can save some money by buying a Europe Travel pack). 14 languages available – Arabic, Dutch, French, English, German, Greek, Italian, Hebrew, Latvian, Norwegian, Portuguese, Russian, Spanish, Swedish. A credit card sized plastic card that you order online. You can also tailor make a card with any special dietary requirements. £6 each or packs available (Europe/Worldwide). UK based, but will post to any country. *The Chinese card is Simplified Chinese which is a simple form of Mandarin. A credit card sized laminated card that you order online. 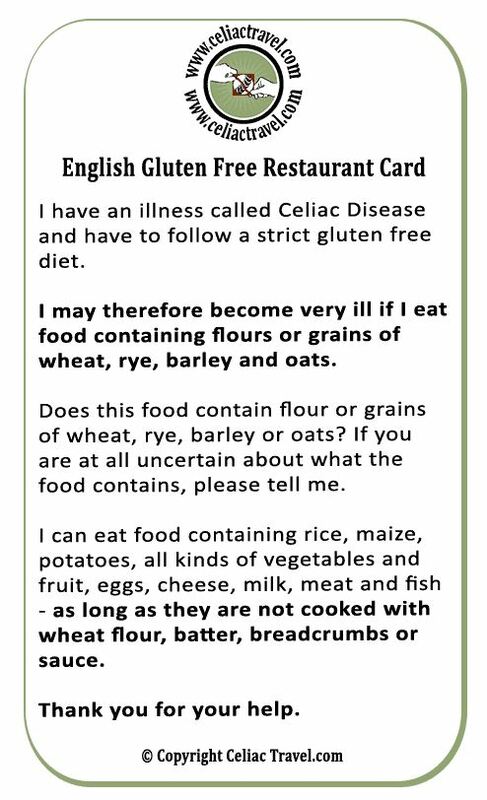 There are pre-made gluten free, GF/DF, GF/Vegetarian options (as well as all main allergies) or you can tailor make a card with any special dietary requirements. USA based, but will post internationally USD$14 each plus P&P. These fold up laminated paper cards differ from the other translation cards, as they tailor the advice for the particular cuisine. USA based, but if you contact them directly they will establish postage costs for your country and mail to you. They also have an app (at time of writing was for Android only). This Gluten Free Travel Guide app has useful country information (local coeliac society, types of food eaten, where to buy supplies) as well as a translation card (AUD$13.99 on iTunes). If you are a member of Coeliac Australia you also have access to over 60 country guides which are free (access via your members login on the website). These include general advice as well as a translation card. Coeliac UK have country guides and translations for many countries around the world, which are free to download (no need for membership). 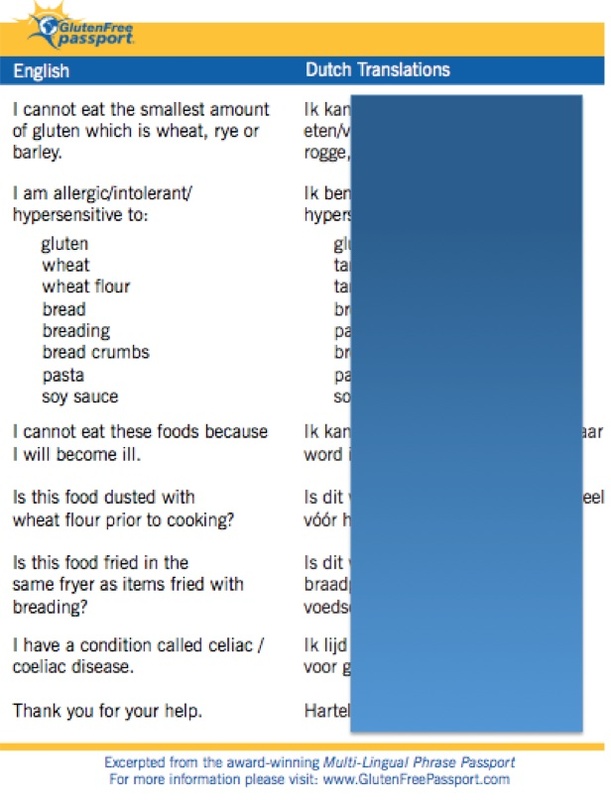 www.coeliac.org.uk – go to Gluten Free Diet & Lifestyle section and look for ‘Holidays & Travel’. If you print a translation card, I suggest taking several copies with you as they do get bashed about a bit while travelling. I always have an English card with me as well as when I was at an Indian restaurant in Russia, the owner there spoke better English than Russian, so he preferred to look at the English version! Travel guide – emergency food supplies!